JQuery Mobile allows you to wrap a “regular” web site into a mobile web-site quickly. Once you have the site “mobile” you can begin to tweak and enhance it, but the first steps should be as fast as possible. This part of the tutorial will show you how to use (HTML5) forms with JQuery Mobile. There’s no requirement to use HTML5 with your forms, but many mobile web-browsers will automatically customise their input mechanisms with specialised keyboards when you do; that makes it much easier for users to enter data on a mobile platform. This will be a fairly short tutorial; the point of the technology is to make the process simple. The jqm/form.html template is a short Django template which extends the jqm/simple.html template to allow for creating “just a form” templates very quickly from your existing forms. You will likely want custom form-handling for your real applications, see the jqm/templates directory for the code to the jqm/form.html template. $ pip install -e "git+https://github.com/rhec/django-html5.git#egg=django-html5"
"""Sample form with HTML widgets"""
The jqm/form.html template substitutes in our title and renders the form as the body of the page. It uses non-AJAX post to work around the JQuery Mobile redirect limitations. The Django messages framework is also used; it is rendered in the jqm/simple.html template as part of the page “header” (the bar at the top of the page). When rendered on most mobile browsers (and most modern desktop browsers), your HTML5 inputs should have enhancements including customised input, basic data-validation and the like. 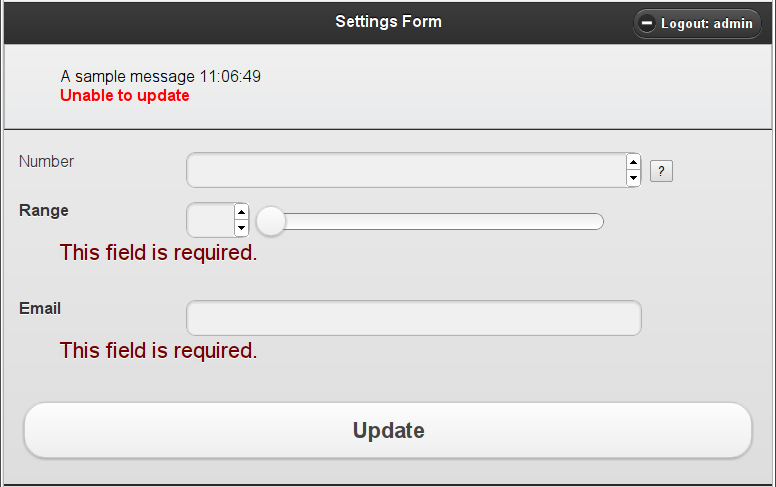 The jqm/form.html template will render an unstyled “help” button for those fields which have help-text defined. Clicking the button will cause the help text to be displayed (again, in an unstyled manner). You may have noticed the strange pattern of importing _ at the top of the module and then again at the bottom of the module. This allows your definition-time (i.e. import-time) references to gettext (the translation entry point) to be to the lazy version, while your run-time references are to the non-lazy version without any special machinery required to have gettext find both. © Copyright 2011, Mike C. Fletcher. Created using Sphinx 1.0.7.